Melody from the opening of Henry Purcell's "Thy Hand, Belinda", Dido and Aeneas (1689) with figured bass below ( Play , Play with figured bass realization). Figured bass, or thoroughbass, is a kind of musical notation in which numerals and symbols (often accidentals) indicate intervals, chords, and non-chord tones that a musician playing harpsichord, organ, lute (or other instruments capable of playing chords) play in relation to the bass note that these numbers and symbols appear above or below. Figured bass is closely associated with basso continuo, a historically improvised accompaniment used in almost all genres of music in the Baroque period of Classical music (ca. 1600-1750), though rarely in modern music. Other systems for denoting or representing chords include plain staff notation, used in classical music; Roman numerals, commonly used in harmonic analysis; macro symbols, sometimes used in modern musicology; the Nashville number system; and various chord names and symbols used in jazz and popular music (e.g., C Major or simply C; d minor or d-; G7, etc.). Basso continuo parts, almost universal in the Baroque era (1600–1750), provided the harmonic structure of the music. The phrase is often shortened to continuo, and the instrumentalists playing the continuo part are called the continuo group. The titles of many Baroque works make mention of the continuo section, such as J. S. Bach's Concerto for Two Violins, Strings and Continuo in D Minor. The makeup of the continuo group is often left to the discretion of the performers, and practice varied enormously within the Baroque period. At least one instrument capable of playing chords must be included, such as a harpsichord, organ, lute, theorbo, guitar, regal, or harp. In addition, any number of instruments which play in the bass register may be included, such as cello, double bass, bass viol, or bassoon. The most common combination, at least in modern performances, is harpsichord and cello for instrumental works and secular vocal works, such as operas, and organ for sacred music. Typically performers match the instrument families used in the full ensemble: including bassoon when the work includes oboes or other winds, but restricting it to cello and/or double bass if only strings are involved. Harps, lutes, and other handheld instruments are more typical of early 17th-century music. Sometimes instruments are specified by the composer: in L'Orfeo (1607) Monteverdi calls for an exceptionally varied instrumentation, with multiple harpsichords and lutes with a bass violin in the pastoral scenes followed by lamenting to the accompaniment of organo di legno and chitarrone, while Charon stands watch to the sound of a regal. Basso continuo, though an essential structural and identifying element of the Baroque period, continued to be used in many works, especially sacred choral works, of the classical period (up to around 1800). An example is C. P. E. Bach's Concerto in D minor for flute, strings and basso continuo. Examples of its use in the 19th century are rarer, but they do exist: masses by Anton Bruckner, Beethoven, and Franz Schubert, for example, have a basso continuo part that was for an organist. A part notated with figured bass consists of a bass line notated with notes on a musical staff plus added numbers and accidentals (or in some cases slashes added to a number) beneath the staff to indicate what intervals above the bass notes should be played, and therefore which inversions of which chords are to be played. The phrase tasto solo indicates that only the bass line (without any upper chords) is to be played for a short period, usually until the next figure is encountered. This instructs the chord-playing instrumentalist to not play any improvised chords for a period. The reason the phrase "tasto solo" had to be used was because it was an accepted convention that if no figures were present in a section of otherwise figured bass line, the chord-playing performer would either assume that it was a root position triad, or deduce from the harmonic motion that another figure was implied. For example, if a continuo part in the key of C begins with a C bass note in the first measure, which descends to a B natural in the second measure, even if there was no figures, the chord-playing instrumentalist would deduce that this was most likely a first inversion dominant chord (spelled B-D-G, from bottom note of the chord to the top). 2 indicates 6 4 2, for example. 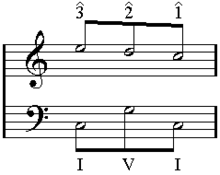 From the figured bass-writer's perspective, this bass note is obviously a third inversion chord, so the sixth interval is viewed as an interval that the player should automatically infer. 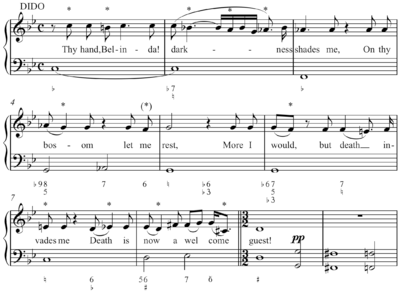 Sometimes the figured bass number changes but the bass note itself does not. In these cases the new figures are written wherever in the bar they are meant to occur. The concept of allowing two or more concurrently performing choirs to be independent structurally would probably not have arisen had there not been an already existing practice of choral accompaniment in church. Financial and administrative records indicate the presence of organs in churches dates back to the 15th century, although their precise use is not known. Many first-person accounts of church services from the 15th and 16th centuries imply organ accompaniment in some portions of the liturgy, as well as indicating that the unaccompanied practice of the Cappella Sistina was somewhat unusual. By early in the 16th century, it seems that accompaniment by organ at least in smaller churches was commonplace, and commentators of the time lamented on occasion the declining quality of church choirs. Even more tellingly, many manuscripts, especially from the middle of the century and later, feature written-out organ accompaniments. It is this last observation which leads directly to the foundations of continuo practice, in a somewhat similar one called basso seguente or "following bass." These new genres, just as the polychoral one probably was, were indeed made possible by the existence of a semi- or fully independent bass line. In turn, the separate bass line, with figures added above to indicate other chordal notes, shortly became "functional," as the sonorities became "harmonies," (see harmony and tonality), and music came to be seen in terms of a melody supported by chord progressions (homophony), rather than interlocking, equally important lines that are used in polyphony. The figured bass, therefore, was integral to the development of the Baroque, by extension the ”classical” style, which built on the innovations of the Baroque era, and by further extension most subsequent musical styles. Many composers and theorists of the 16th, 17th, and 18th centuries wrote "how-to guides" for chord-playing musicians, to aid them in realizing figured bass notation, including Gregor Aichinger, Filippo Bonaffino, Friedrich Erhard Niedt, Jean-Philippe Rameau, Georg Philipp Telemann, C.P.E. Bach, and Michael Praetorius. 4. If this same C major triad had an E in the bass, it would be a first inversion chord, which would be written C6 (this is different from the jazz notation, where a C6 means the chord C-E-G-A, i.e., a C major with an added 6th degree). The symbols can also be used with Roman numerals in analyzing functional harmony, a usage called figured Roman; see chord symbol. ↑ Benward, Bruce; Marilyn Nadine, Saker (2003), Music: In Theory and Practice, Vol. I (Seventh ed. ), : Mcgraw-Hill, p. 77, ISBN 978-0-07-294262-0 . ↑ Schoenberg, Arnold (1983), Structural Functions of Harmony (Seventh ed. ), London: Mcgraw-Hill, pp. 1–2 .